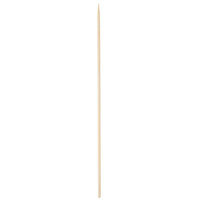 Did you mean flat bamboo skewers? 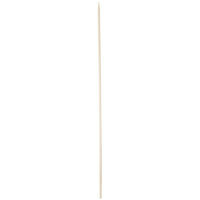 These flat bamboo skewers are versatile kitchen accessories ideal for a variety of different uses! Whether you operate a steak house, bakery, coffee shop, or other commercial kitchen, you’re sure to find a useful application for these skewers. Since these flat skewers are made from bamboo materials, they’re eco-friendly alternatives to other skewer styles. Use these flat bamboo skewers as meat markers to identify the wellness of your steaks, or use them for grilling vegetable kabobs. Many of them feature flat heads that allows you to easily write on them to label foods, so you can place them in various baked goods to display in your bakery case. 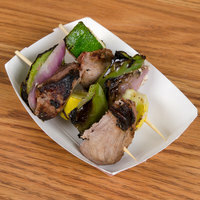 Not only do these skewers serve as unique accessories to your food items, they help prevent cross-contamination, and make allergies or other dietary restrictions easily visible to customers.